Villa Sol Casanova is single storey, traditionally styled 2 bedroom villa with wonderful views of the hillside and down to the sea. It has a spacious pool terrace, a purpose - built BBQ area and a covered terrace - all ideal places from which to admire the splendid views. Guilche Beach is 15 minutes' walk away downhill, whilst the picturesque town of Nerja is a 10 minutes' drive away. Air conditioning/heating in the bedrooms and WiFi are included. The wonderful sea views that can be enjoyed whilst relaxing by the pool or dining alfresco. An idyllic setting! There is plenty of space surrounding the private pool where you can relax with a good book. The purpose-built bar and BBQ area is adjacent, and coupled with the table and chairs on the covered terrace is ideal for alfresco dining. There are splendid views to be enjoyed from both the poolside and covered terrace - a great setting for a relaxing holiday. Access to the villa is via a steep hill and there is parking on the driveway for your hire car. Passing the swimming pool, you will come to the covered terrace and the main entrance. The front door leads directly into the homely open plan living area. There is comfortable seating surrounding the featuring fireplace and flat screen TV, whilst to the other side of the room is the dining area and fully equipped kitchen. This space is decorated in local Spanish style and is bright throughout, with beamed ceilings adding a traditional feel. There is a double bedroom and a twin bedroom, both sharing a separate shower room. Both bedrooms have wooden ceilings plus a traditional and homely feel. This villa has applied for a licence with the Junta de Andalucia and the application number is CTC 2016 109310. The licence number will follow. Set in the hills above the Tamango Hills area, this delightful villa is in a terrific position surrounded by beautiful countryside and amazing views of the coastline. Guilche Beach is 15 minutes' walk away on foot downhill. Plus, the seaside town of Nerja with more beaches and plenty of shops, bars and restaurants is only 5 minutes' drive away. You're also within driving distance of the picturesque white village of Frigiliana, Nerja Caves and the Aquavelis Water Park. Our properties Nadia and Rodriguez Sol are located nearby. There are plenty of shops to browse along the cobbled streets of Nerja. Taking a stroll along the Balcon de Europa is entertainment in itself, with such a variety of open air cafes, ice cream vendors and even street entertainers. There are several local markets in this area and each town has a specific day of the week to exhibit their wares including fresh local produce, handcrafts, leather goods and ceramics. The centre of Nerja with its endless selection of bars and restaurants is around 5 minutes' drive away. Its highlight is the Balcon de Europa where people come from near and far to enjoy the terrific views. There is also plenty of nightlife available, mostly concentrated in the Plaza Tutti Frutti and the Calle Antonio Millon areas. The closest beach to Villa Sol Casanova is Guilche, 15 minutes' walk away or just a few minutes by car. Alternatively, the popular Burriana Beach is well worth a visit with a range of water sports and activities going on. There are lovely areas on the beach with special chill out sunbeds where you can spoil yourself. Or, more central to the town is the Carabeo stretch of beach, this area comprises more of little coves, some of which are reached by long flights of steps. The Aquavelis Water Park, located in the nearby town of Torre del Mar is well worth a visit. The famous Nerja Caves are just out of town where you can see pre-historic paintings and the longest stalactites in the world. Alternatively, not far and inland from Nerja is the beautiful Spanish village of Frigiliana, which is steeped in history. Or, if you wish to venture further afield the Sierra Nevada Mountains and the unmissable Alhambra Palace in Granada are only a couple of hours away. For golf lovers the Baviera Golf Course is located in Caleta de Velez, about half way between Nerja and Malaga city. Between the resorts of Nerja and Frigiliana there are many walks to enjoy, some with local guides available. Walking along the River Chillar in summer is great fun with a cooling splash in the water and plenty of wildlife to see. Villa Sol Casanova is not available to book for season as it is sold out. Take a look here at the Andalucia villas that are currently on sale. Sol Casanova, truly a little bit of paradise, the pool and gardens were a delight and the view stunning! Villa was very clean and equipped to a high standard with lovely furnishings. We will return. The villa was brilliant, fantastic views, very clean and had everything we needed. Had a very relaxing lazy time. 2nd visit to this villa. The villa is beautiful and the view is wonderful. This is a beautiful property with superb views from its hillside location. The owners are very friendly and welcoming, and the villa has everything you need for a relaxing break. We've already booked for next year! Villa was clean, maintenance was good and regular, views were lovely, plenty of utensils, nice big fridge. Plenty of space for a family of 4 and table tennis and pool table provided endless hours of entertainment! The villa was immaculately clean with a glorious view of the ocean, not overlooked and only a 3 minute drive from the town, all in all the perfect spot for a relaxing getaway. I would gladly recommend to friends and family.Keep up your excellent standards and service and we'll keep booking with you. 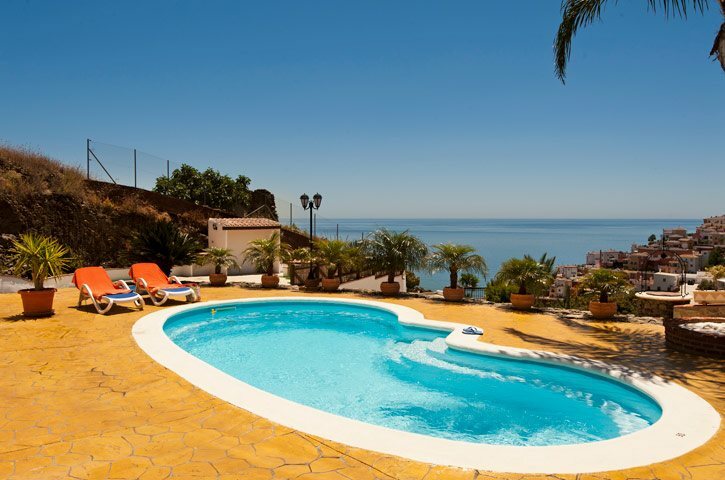 Sol Casanova in Nerja was a beautiful villa with amazing views and fantastic owners who took a real pride in their property. The description didn't do justice to the quality of the villa and the wonderful views. We loved it!!! The rep came to see us on Monday with lots of info regarding what to do and where to go and was very helpful but apart from that we didn't need her for anything. The villa was exceptional. The views were absolutely fantastic, it really felt as though you had left the rat race behind. We are getting ready to book for next year.